Главная Новости Happy Birthday, Will! On behalf of the Russian Shakespeare, the World of Shakespeare and Shakespeare’s Contemporaries projects I am honored to write this at the end of the Shakespeare week. Not being a Shakespearian scholar as such, I well understand that without Shakespeare Russian scholarly and artistic communities would never have paid so much attention to the wonderful burst of creativity in England of his time. We would never have been talking of metaphysical poetry (I did my candidate degree thesis on John Donne), or of anything else written in between 1550 and 1650. OK, we would — as scholars. Other authors — Donne, Jonson, Marlowe, any other Shakespeare’s contemporary — being hidden in the shadow of Shakespeare for a while, have come out of this shadow to the same expectation of speaking in an independent and unique voice. And they all began to matter. Debates around historical Shakespeare will persist, raging in Russia probably more viciously than in any other non-English speaking country. The clearer we see William Shakespeare of Stratford as a historical man, in a society troubled by fears, instability, fragile political order, in a society quite similar to ours. A timeless writer — and an actor and playwright moved by fame and worldly concerns so familiar to everyone. But there’s another dimension to East European Shakespeare. He has always been a symbol of how a man of art can freely look at history, at politics, at life around him, get down from elitist disengagement to surveying the everyday, put tyrants in the same league with clowns. He has helped us realize to what extent the world really is a stage, and how much a human being can do on this stage. 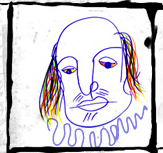 Here in our own way we feel that Shakespeare was, and remains, our contemporary. You would have probably never expected to hear that from the endless plains of Muscovy, but we need you, warts and all, symbolic and real, more than ever. Happy Birthday, Will. For more info see Happy Birthday Shakespeare page.